A couple of weeks ago, I picked this up from the convenience store for the first time and thought I would share it with you! I was intrigued as soon as I saw the packaging, as usually I see this on the 1 litre and 200ml size packages of soy milk in the shops. This green one is the regular one, but there are all sorts of assorted colours for an array of different flavours including: chocolate, coffee, green tea, strawberry, almond, banana, pudding, mango and most recently, chocolate orange. I have tried quite a number of them, and some have been hit and others miss, but the best one for me is probably just the plain version. 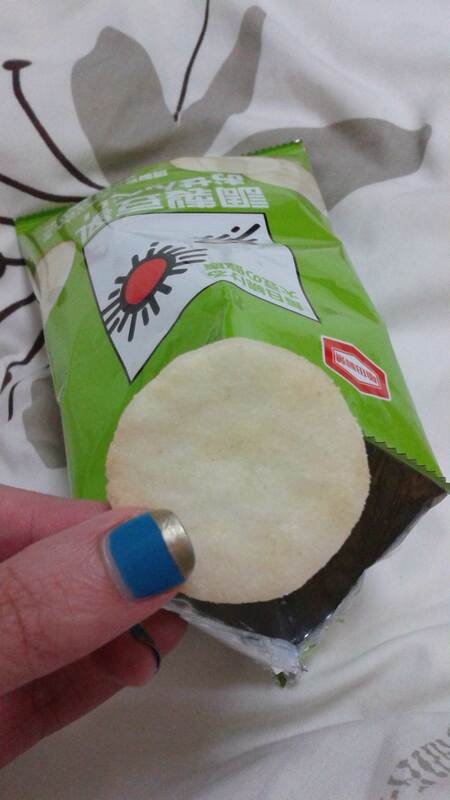 I’m not sure whether that is a normal person’s reaction – I don’t think most people would be elated by a new flavour of rice crackers, especially soy milk ones, but I’m easily excited and entertained, and I love rice crackers as well, so there you go. Opening the packet was a little nerve-wracking as I didn’t really know what to expect. I picked a little disc out, took a deep breath, and popped it into my mouth. As soon as started munching, all of my worries disappeared. They were delish! 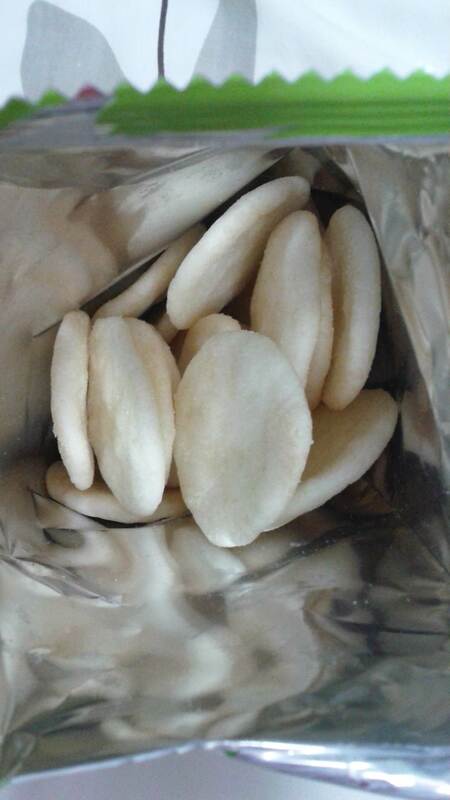 They are crunchy, but not the painfully hard rice cracker types you can sometimes get that dig into your gums and hurt like mad, they’re more the soft-crunchy type. I know that sounds weird, and quite impossible, but I don’t know how else to describe them – that’s what they are. If you are expecting a mouthful of soy milk, that is not what these deliver. Soy milk is one of the ingredients that go into these, but they aren’t soy milk flavoured per se. As you can imagine, that would be really weird, and I don’t even think that I would like them! They come in a nice sized packet for one person. This is always a winner for me, as I simply cannot open a packet of anything and not finish it – I don’t have to feel bad about doing that with these. 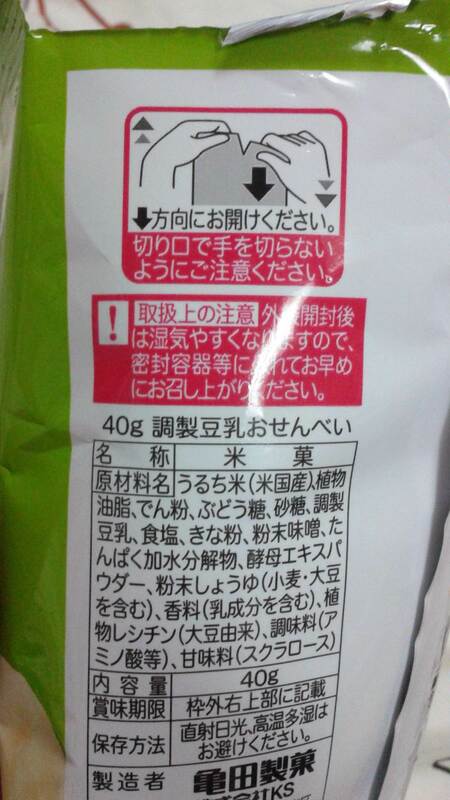 My kanji reading skills are ridiculously bad, so I can’t really tell you anymore about it, and I do apologise for this practically useless post, but I do hope that you enjoyed this latest instalment of Japanese snacks that I cannot live without… at least until the next one comes along! I hope that you are all having a marvellous weekend. I shall write up the post as soon as I have time. 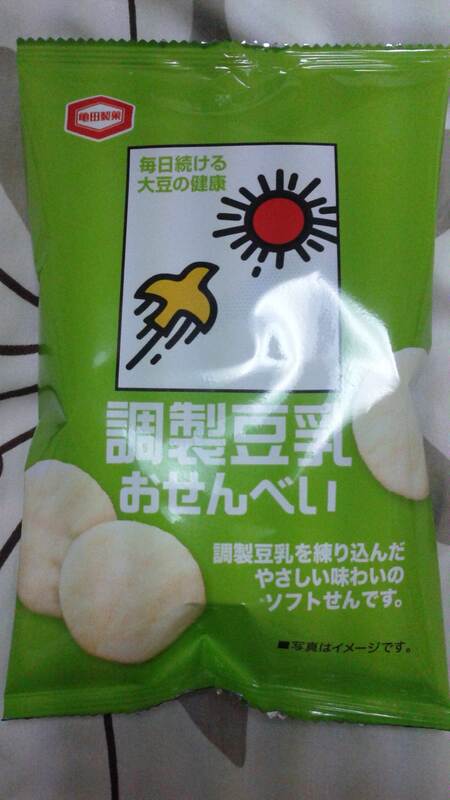 Reminds me of Hello Panda snacks and my favorite is the “milk” flavor :). When I first read the title of your post, I thought you were going to talk about milk-type sodas that Japan has such a wide variety of! I’m obsessed with the cool drinks at the Asian grocery stores and I’m always trying to taste new flavors. Don’t know if you’ve heard of Milkus brand drinks but they are DELISH.